This is a one tray wonder that requires very little time and attention so it is perfect for a midweek meal. Choose good quality sausages that are well seasoned and remember sausages don’t always have to be pork- I used zebra sausages from Oslinc: www.oslinc.co.uk. 1. Get going by preheating the oven to 180c/ 160 fan. Take a large pan and add a drizzle of vegetables oil before heating. Add in the sausages, garlic and rosemary and cook until the sausages are turning golden. Remove and set aside. 2. For the vegetables, take a roasting tray and add a little oil so the veggies don’t stick. Add in the vegetables and pour over the honey and balsamic vinegar with a good crack of pepper and salt. Sprinkle over some chilli flakes and toss again. Add in the sausages, garlic and rosemary and give another toss before covering with foil and cooking in the oven for around 35-45 minutes. 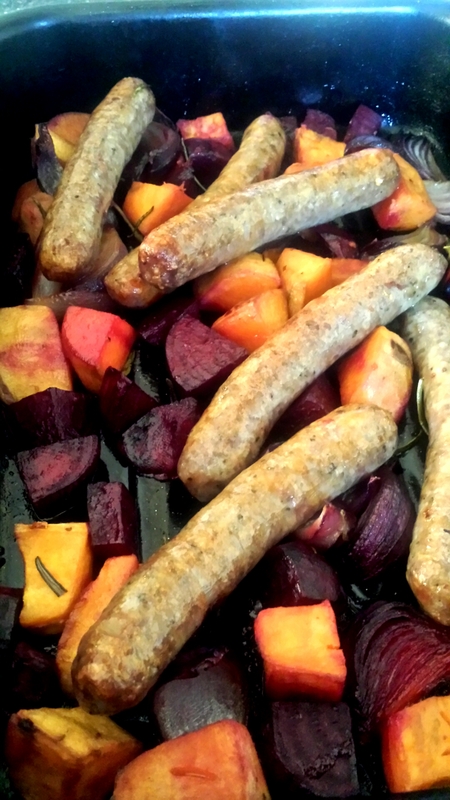 The sausages should be cooked through so the juices run clear and the vegetables will be tender when tested. Just before its ready you can remove the foil and cook for the last few minutes uncovered to get an extra bit of colour. Honey and balsamic sausage and vegetable tray bake- a midweek winner that is short on time and big on taste!